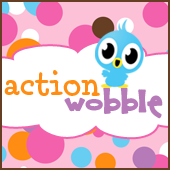 This is Melissa with Moe Creations and it's my day over at the Action Wobble blog. I made a card inspired by Creations with Christina. I just loved her birthday hat and the colors were gr8t! My best friends birthday is March first, so I will be sending this to her! I hope you enjoy my card! !